Well since I’ll be running off in a few days I’m not sure how much crafting I will get to. Plus I already slacked by not finishing my slippers from 2 weeks ago! 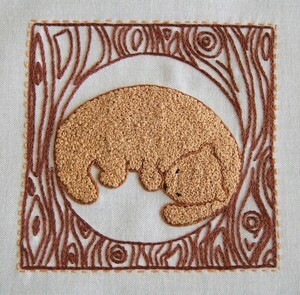 I plan on tackling this lovely embroidery pattern. It’s pretty portable and I’m sure I can tackle it while on a beach. It’s one of the many masterpieces created by Nicole of Follow the White Bunny. She writes each week on Feeling Stitchy and she sells her patterns in this shop and on Etsy. It’s an adorable little hedgehog floating in a tea cup, he’s even paddling his way around. It’s super cute. Buy it here. 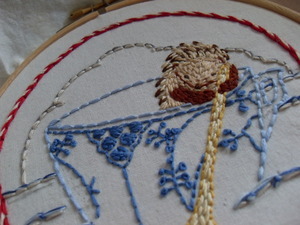 This entry was posted in createalong, embroidery and tagged embroidery, hedgehog, pattern, stitching. Bookmark the permalink. I’m sneaking my crochet projects into my bag ready to hook away over christmas at Mama Pigeons. Love a portable project!